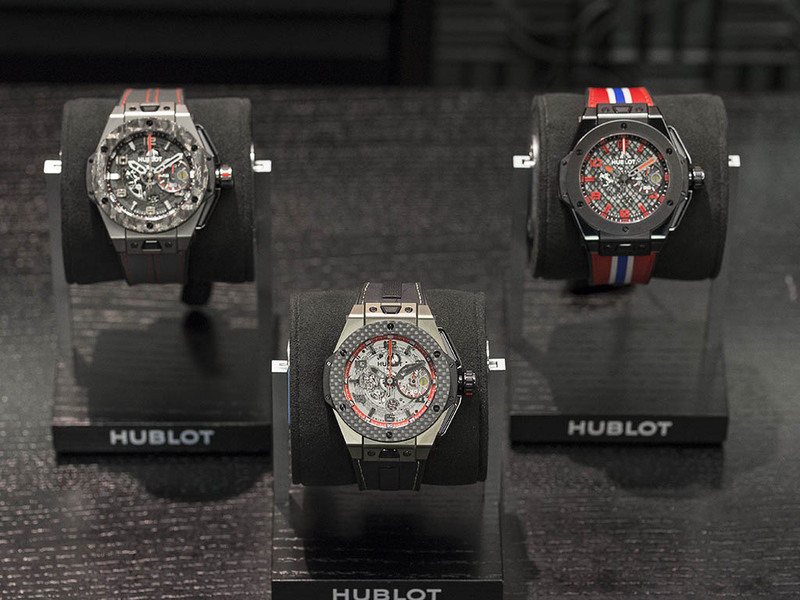 The “Limited Edition” concept has became a must for most watch brands nowadays.Being used as a marketing strategy, limited edition watches attract the watch aficionados directly. 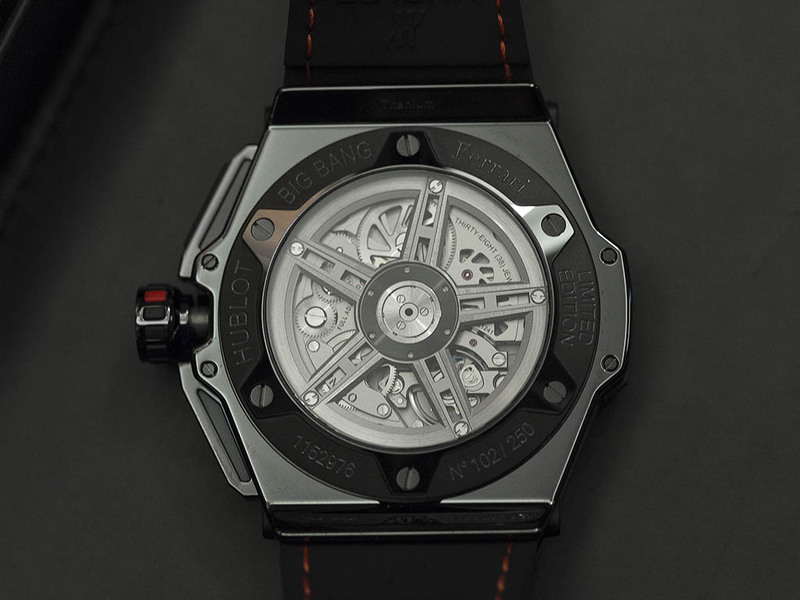 In this regard, limited edition concept acts a live saver for most cases however, the excessive use of the concept may easily damage the brand's reputation. 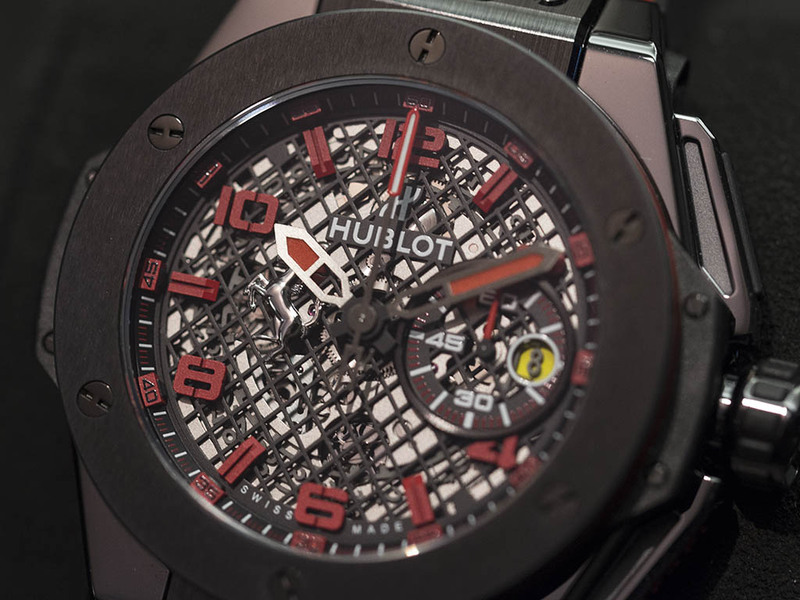 In my opinion Hublot's strategy for limited edition products varies between those two sides.One can easily name more than a few limited edition models out of Hublot's creations.Having a vast amount of products, there are simply good or not good examples. Fortunately I would list the Ferrari themed ones in the “good” section. 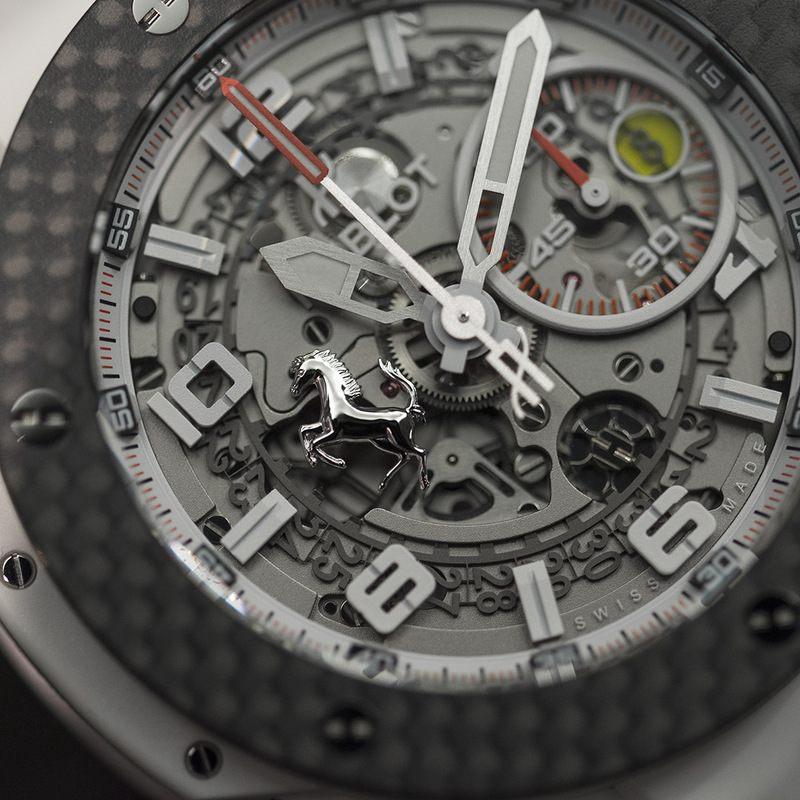 Let's see what those Ferrari editions have in common. They have 45mm case diameter, double sapphire crystals front and back and a WR100M rate which is suitable for an every day user. 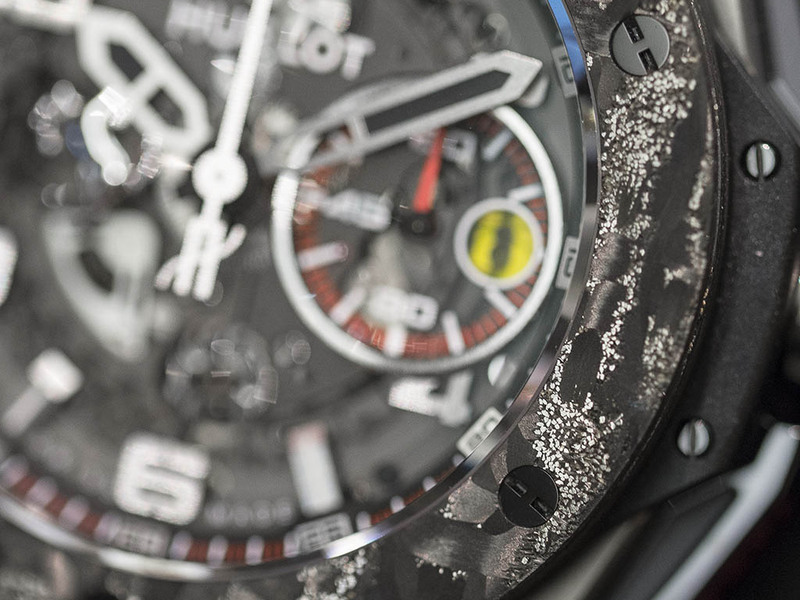 Movement wise speaking, the Flyback Chronograph versions are powered by the famous in-house caliber Unico 1241. 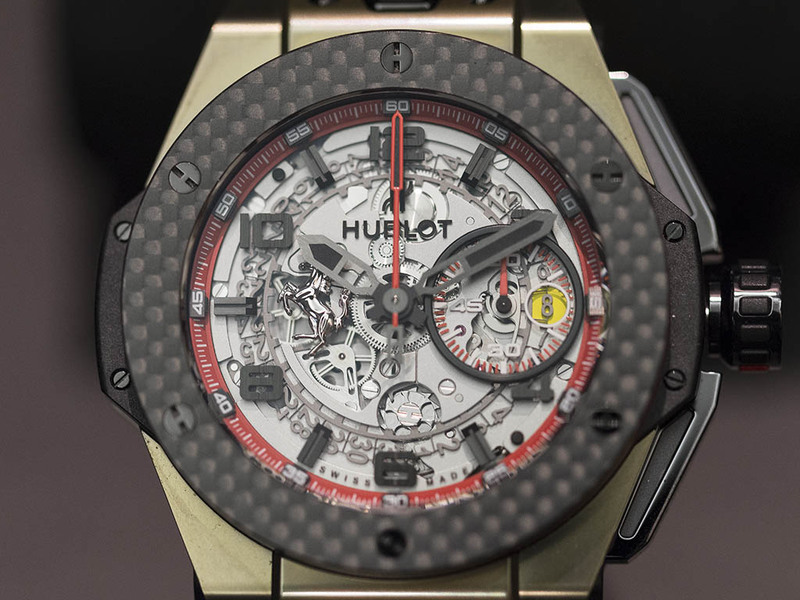 I am glad to see that Hublot finally dropping the Valjoux 7750 calibers in favour of a brand new and an in-house caliber. Surely this would also help the brand to justify the price tags. Both watches have a display for column wheel mechanism at 6 o'clock position.60 minutes counter sub dial is located at 3 o'clock position. 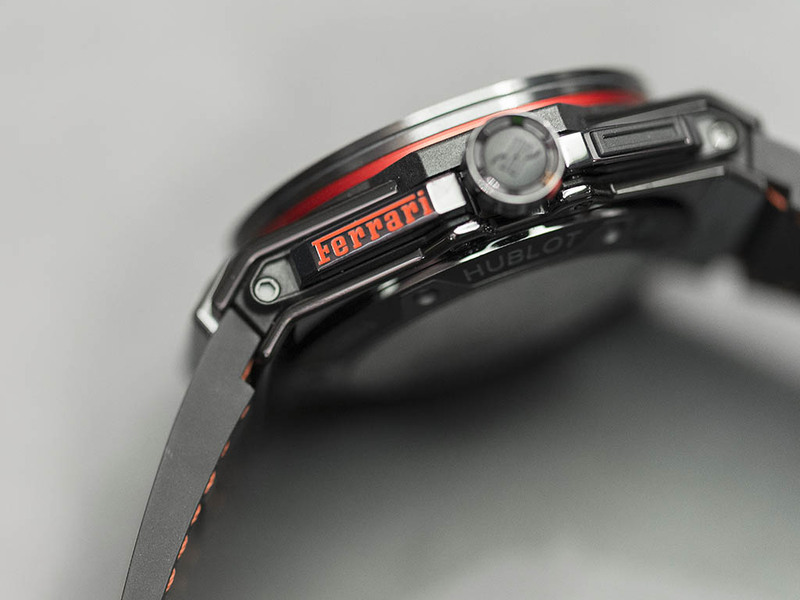 Ferrari logo at 3 o'clock position and Hublot logo applied underneath the sapphire are the common design features of the watches. Watches come up with a smart strap change system as well. 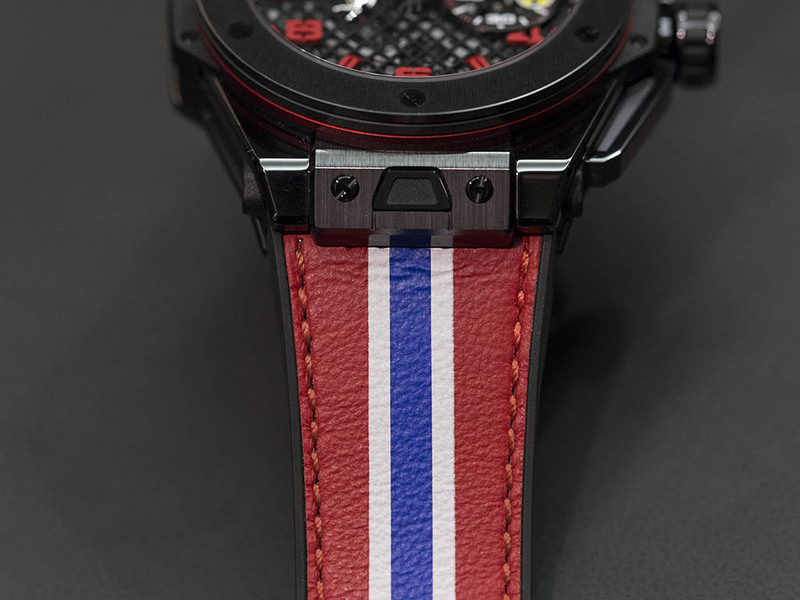 Considering the fact that strap is an exclusively designed part for each limited watch, the system would not feel that handy. The front side have screws.. Lots of screws.. 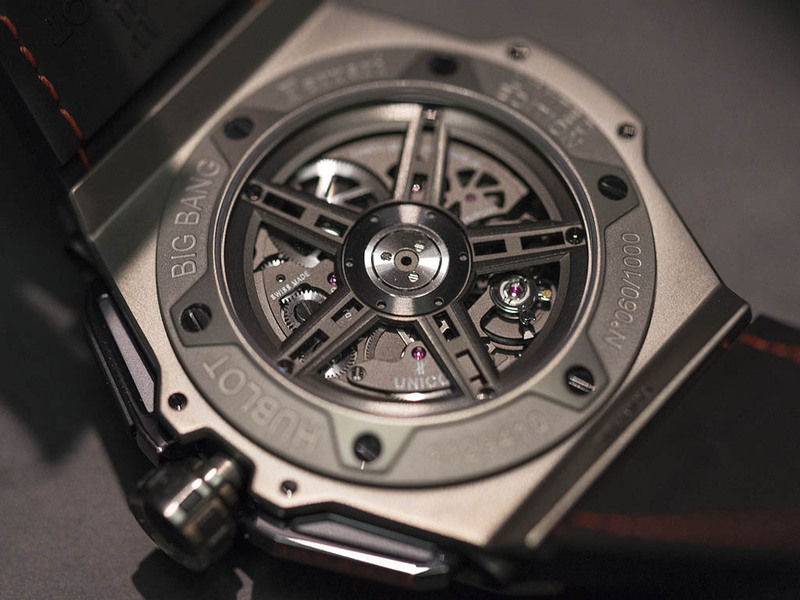 This screw thing is lead by Audemars Piguet's iconic design: Royal Oak.As an admirer of the design, Biver mentioned his inspiration of RO/ROO models in several interviews. 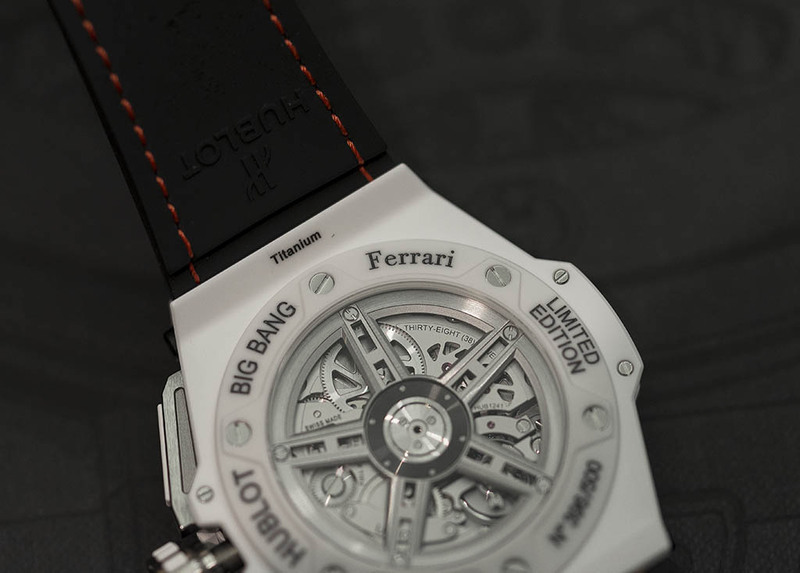 Ferrari engraving on the chronograph pusher, air ventilated brake disc pattern on the rotor, hi-tech materials thrown in.. This watch makes me think that I should not be driving a family sedan while it's strapped to my wrist. 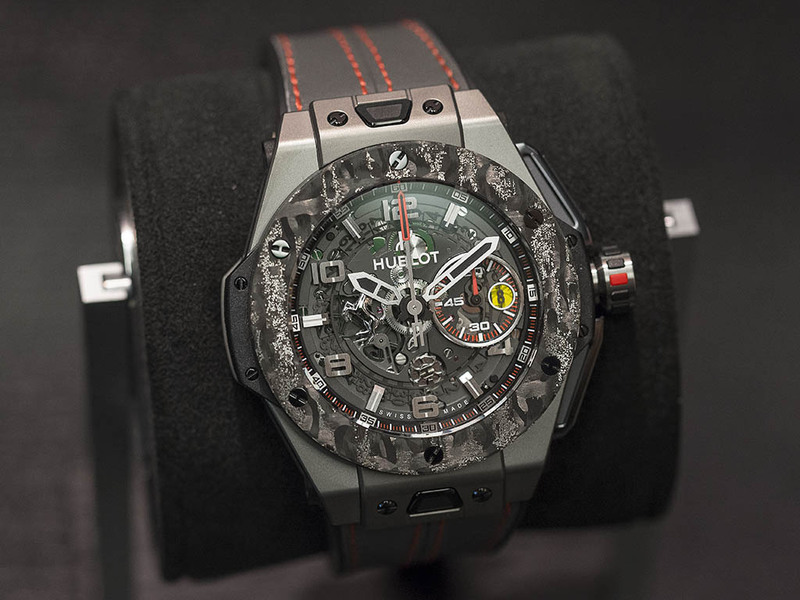 As mentioned before, all watches are limited editions. 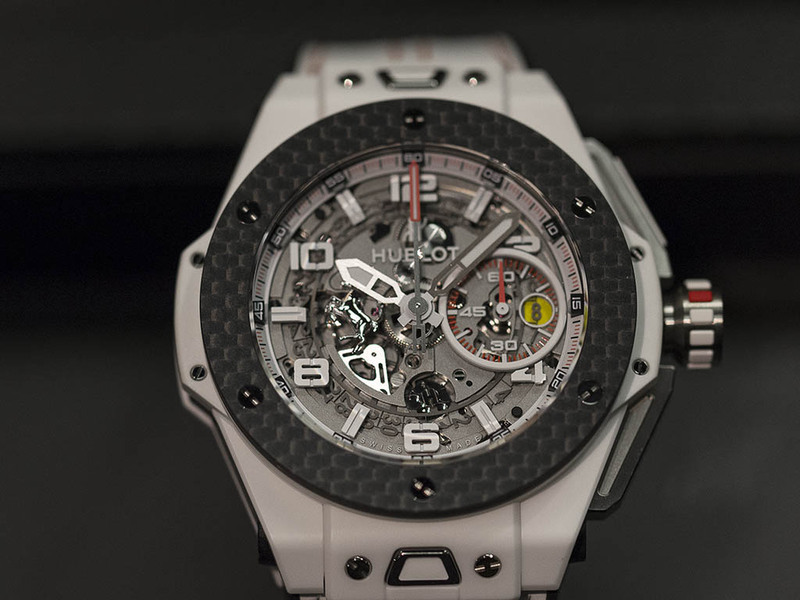 White ceramic case with carbon fiber bezel model is limited to 500pcs, black ceramic case with black ceramic bezel model is limited to 250pcs, gray ceramic case with black carbon fiber bezel model is limited to 1000pcs and finally magic cold case with black carbon fiber bezel model is limited to 50pcs only. 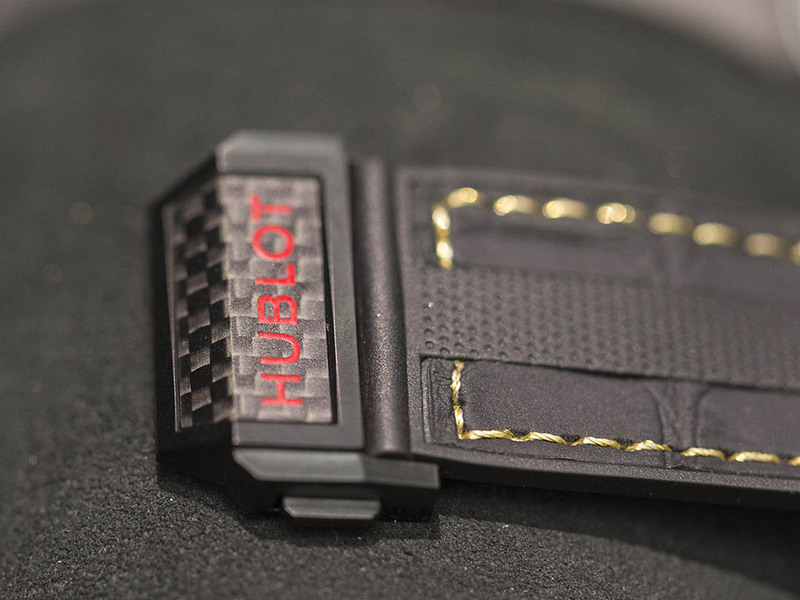 Hublot uses two different kinds of carbon fiber in it's products. The first type is prepared in layers, put together via epoxy afterwards and baked. The other type is prepared with minor pieces of carbon forged in to molds and baked. The difference between this two type of materials is actually visible to the naked eye as one has straight form of squares while the other has random patterns.